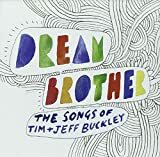 In a lean week for CD releases, my only preorder was the tribute album, Dream Brother: The Songs of Tim & Jeff Buckley, which features Sufjan Stevens, the Magic Numbers, Kathryn Williams and others. I will be headed out to look at DVD's tomorrow, in particular Tim Burton's Corpse Bride, looking for a bargain too good to pass up. What is everyone buying this week?